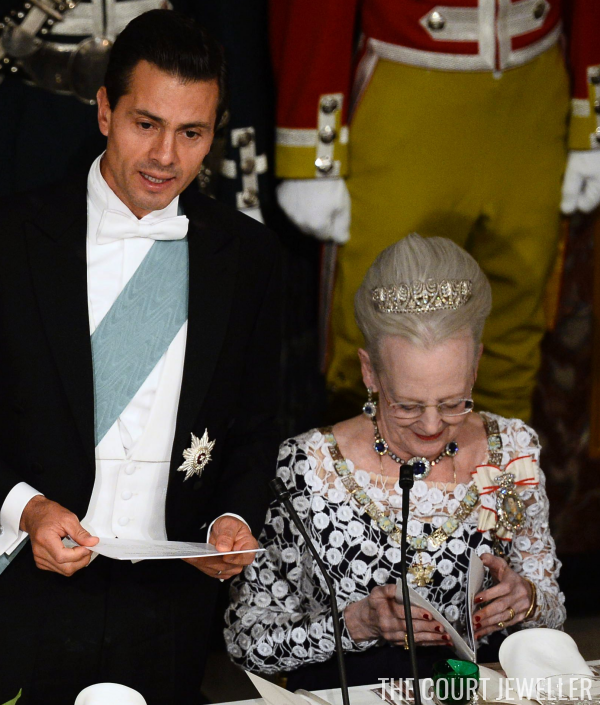 The Danes rolled out the red carpet for President Enrique Pena Nieto and First Lady Angelica Rivera of Mexico on Wednesday, and the diplomatic extravaganza included a glittering white-tie banquet. 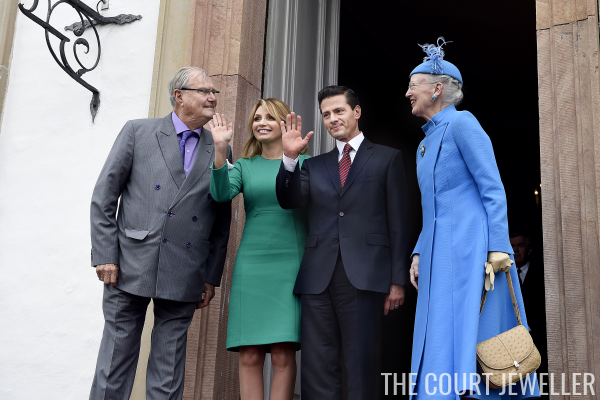 Queen Margrethe II of Denmark wore pieces from her turquoise collection to greet her guests. Crown Prince Frederik and Crown Princess Mary hosted the president and first lady on a visit to Kronborg's Maritime Museum, though Mary (disappointingly) wore little jewelry. Here's a better look at the tiny cluster stud earrings she wore. 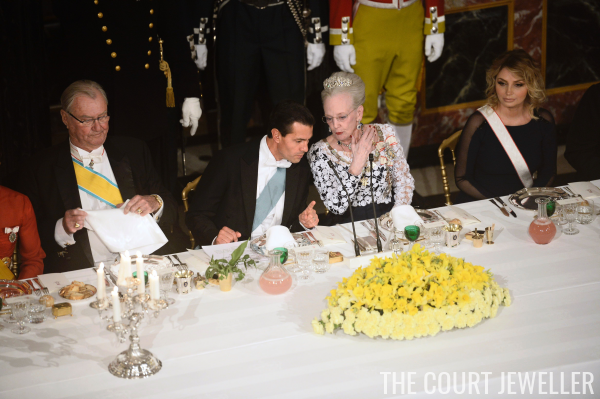 The royal ladies were saving up their major sparkle for the evening's state banquet. Queen Margrethe wore the Baden Palmette Tiara with the sapphire suite that belonged to her grandmother, Queen Alexandrine. Crown Princess Mary wore her new Edwardian-era tiara again, this time pairing it with a different pair of earrings. Here's another look at her jewels. 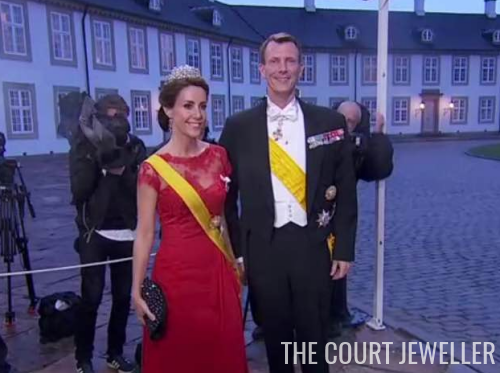 Princess Marie chose her standby sparkler: Princess Dagmar's Floral Tiara. One more view of Marie's jewels. 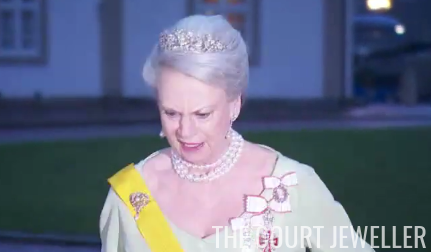 And Princess Benedikte, who was cringing a bit because of the rain as she arrived for the banquet, wore her Floral Birthday Tiara with pearl jewelry.